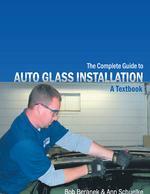 The Complete Guide to Auto Glass Installation is a comprehensive textbook on auto glass replacement and repair. It outlines the safe and proper installation and repair of all auto glass used in domestic and foreign motor vehicles and off road equipment. The Guide is written by two experts who have 42 total years of experience in the auto glass industry and 36 years of training experience in both technical and customer service. The Guide is written with the student in mind. It includes easy, understandable step by step instructions illustrated with color photography, diagrams and tables. It aids the instructor with learning quizzes and exams. • Provides for the customers’ comfort and safety. This Guide not only helps the student learn how to put in auto glass but also teaches why the correct procedures are important. Improper auto glass installation can endanger the vehicle occupants and cause undue liability exposure to the installation shop. This Guide teaches the proper procedures according to Federal Motor Vehicle Safety Standards and the ANSI/AGRSS Safety Standard. Auto glass installation is too important to the well being of the consumer and to the long term success of the repair shop to put the responsibility into the hands of others. Auto glass technicians and auto collision professionals must maintain the highest standard of safety glazing. This Guide aims to assist in that endeavor.